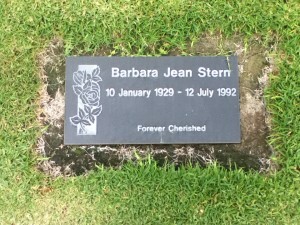 On 12 July, 1992, my mother died of a heart attack after being disabled for the last 13 years of her life from a stroke. I delivered the eulogy at her memorial service. On this tenth anniversary of her death, I’d like to share my memories of my mother with you. I read this poem nearly six years ago  at my father’s memorial service. One of my regrets about his death was that I never got to see his body. The mortician refused to let me look at it. “You don’t want to remember him this way,” he told me. But I wanted to see him one last time. I wanted to say goodbye. When I went to the emergency room where my mom died, I wanted to see her body. This time, my request was granted. When I looked at her face, I didn’t see the face of a corpse. Instead, I saw the face as I always remembered it — full of life. I saw her face beaming with pride at my Eagle Scout ceremony. I saw it laugh freely and joyfully at our engagement dinner, when she met my new in-laws for the first time. I saw her warm smile when my wife gave her a rose at our wedding ceremony. It was only twenty-four hours before her death that my wife and I were having lunch with her at Carl’s Jr. to celebrate my birthday. I could still see her sipping on a Diet Coke and sharing her French fries with us. For some reason, we seemed to stay longer at the restaurant than usual. She didn’t want us to leave, and we didn’t want to leave her. The thing I remember most about my Mom was her kindness and generosity. She cared more about others than she did about herself. Even when she couldn’t afford things for herself, she always made sure my brother and I had everything we needed. Mom supported us in our efforts. I remember her always encouraging us and taking pride in our accomplishments. Mom’s caring for others extended into her spare-time activities. When my brother and I entered Vanalden Elementary School in Reseda, she started a teacher-aide program through the school’s PTA. Mom later became the PTA’s president. She also was involved in our Boy Scout activities by serving as den mother for our pack and joining us on camping trips. Mom’s caring even extended after death. I remember when organ-donor cards first came out for California Driver’s Licenses. Mom filled hers out immediately and she encouraged me to do the same when I was old enough to drive. In honor of her request, all of her usable organs and tissues were donated to the UCI Medical Center. UCI will study this material to help other victims of stroke. Some would say that Mom had bad breaks in her life. She suffered a stroke in 1979 that paralyzed her right side and robbed her of her speech. In 1987, just as she was beginning a new life in Orange County, she developed blood clots in her left leg that required it to be amputated. She had been confined to her wheelchair ever since. But her disabilities never robbed Mom of her courage, her indomitable spirit, and her desire for life. She never stopped caring about those who matter to her. I will remember her as disabled with as much love as her healthy. Some would ask if more could have been done for her, so she wouldn’t have died at this time. Maybe if we did this, or maybe if we didn’t do that, that somehow she’d still be with us a little longer. When she lost her leg, her doctor warned me that it would only matter of time until another blood clot would claim her life. We’re just grateful for the years since then that she was able to share with us. We’re grateful she was there to spend time with her mom, to watch my brother make a life of his own, and to watch my wife and I meet and begin our lives together. Therefore, let us not feel guilty or lay blame. Let us rejoice and cherish the time we had with her. When I think about my mom’s lifeless face, I can still see the compassion, determination, and love that face has shown her entire life. This is the way I will remember her.